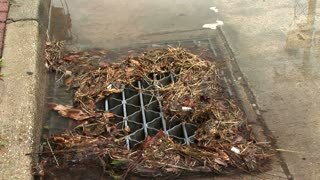 Search Results for "storm drains"
Rain Runoff into Storm Sewers. Heavy thunderstorm rains fill street and gutters only to be channeled down storm drains into sewers. Water running in a storm drain in Ojai, California. Thunderstorm rains and hail back up storm drains serving this Denver highway. A low angle shot of cars driving past in the middle of a storm. Water rushes past as it makes its way to the drains. UK August 2018 - Police forensic teams search drains for evidence following the stabbing of a teenage boy in East London. Pan of a Don't Dump Drains to Creek sign in Ojai, California. Sad lonely girl sitting by the window and looks outside while rain goes. Heavy rain downpour falls onto a metal roof with a flue and drains off of the edge. Large, green trees surrounding the roofed structure in the background.